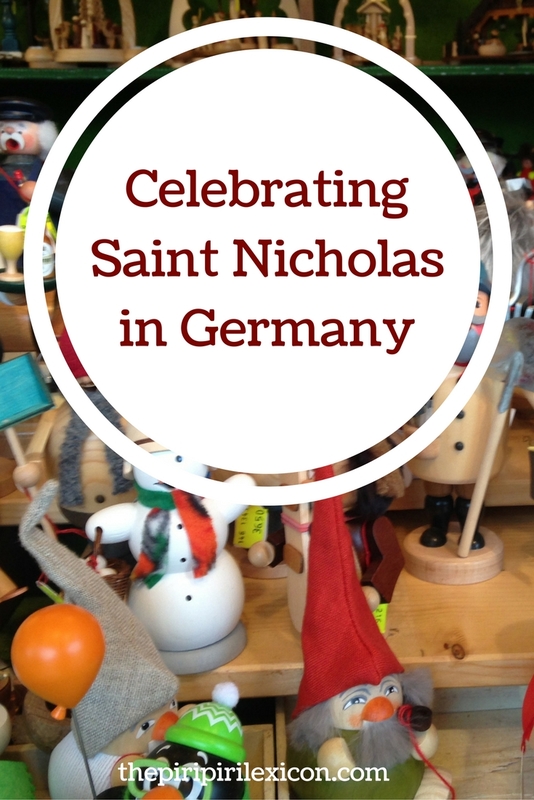 As we near our 5th Christmas in Germany, it is about time I wrote about Saint Nicholas. 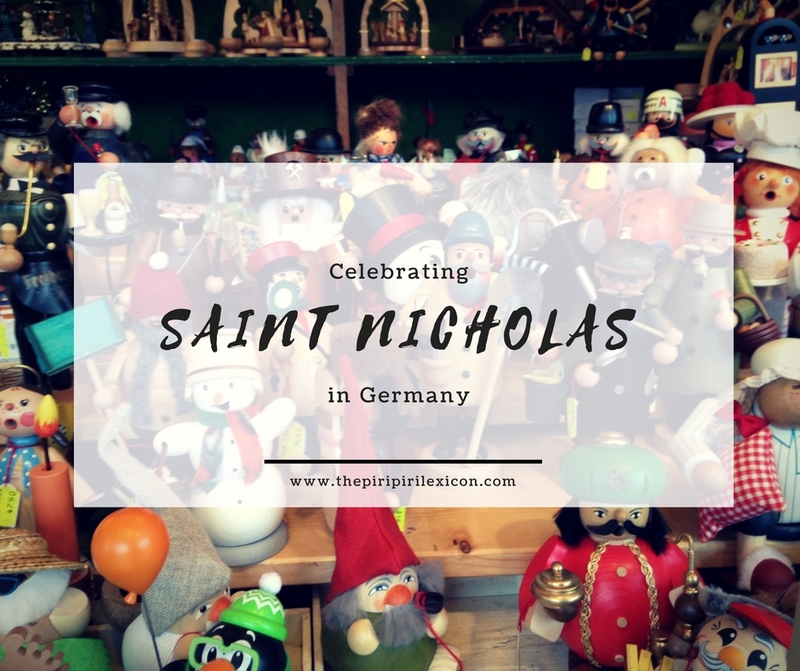 Before, we moved here, I vaguely knew what Saint Nicholas was about but never really realised the tradition was still going strong in Germany. Saint Nicholas was born in, what is now, Turkey then in the Roman Empire, to a Greek family during the third century. As his parents died, he used his inheritance to help the needy. He dedicated his life to help the poor and was made Bishop of Myra while still young. 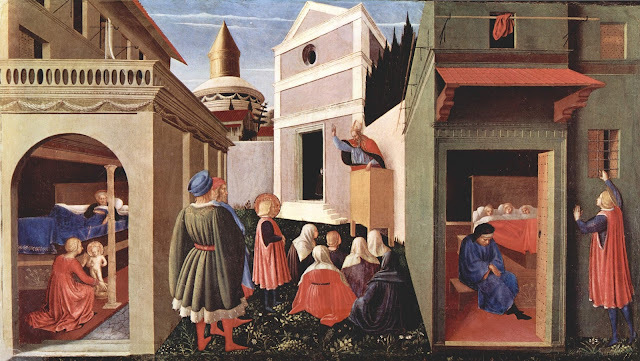 Bishop Nicholas became known throughout the land for his generosity to those in need, his love for children, and his concern for sailors and ships. There are many stories celebrating his deeds and good actions. A lot of these stories relate to traditions we still use today.For example, hanging a stocking by the chimney is said to originate with Saint Nicholaus. There was a poor man who had three daughters. He was so poor, he did not have enough money for a dowry, so his daughters couldn't get married. One night, Nicholas secretly dropped a bag of gold down the chimney and into the house. The bag fell into a stocking that had been hung by the fire to dry! This was repeated later with the second daughter. Finally, determined to discover the person who had given him the money, the father secretly hid by the fire every evening until he caught Nicholas dropping in a bag of gold. Nicholas begged the man to not tell anyone what he had done, because he did not want to bring attention to himself. But soon the news got out and when anyone received a secret gift, it was thought that maybe it was from Nicholas. In the 16th Century, Saint Nicholas lost his appeal. Yet, someone had to bring gifts for children and this old man figure became Father Christmas as the date shifted to Christmas. Saint Nicholas is very much the original Santa. It is the anniversary of Saint Nicholas' death, on the 6th December 343AD, that we celebrate today. Nikolaustag (the Day of Nicholas) is celebrated in Germany (or at least where we are in Germany) and in many other countries in Europe. He is still the one who brings presents to the children if they have behaved. Many families now celebrate Christmas and exchange gifts then too. 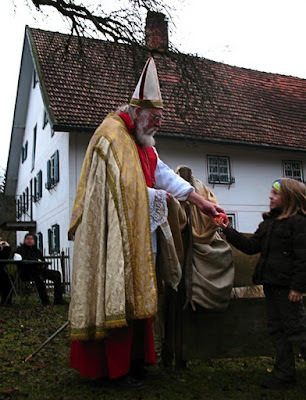 But Saint Nicholas is still very much part of today's traditions. At school, for example, it Nikolaus who comes and give a small gift to the children. In shops, Nikolaus is there to take pictures with the kids. 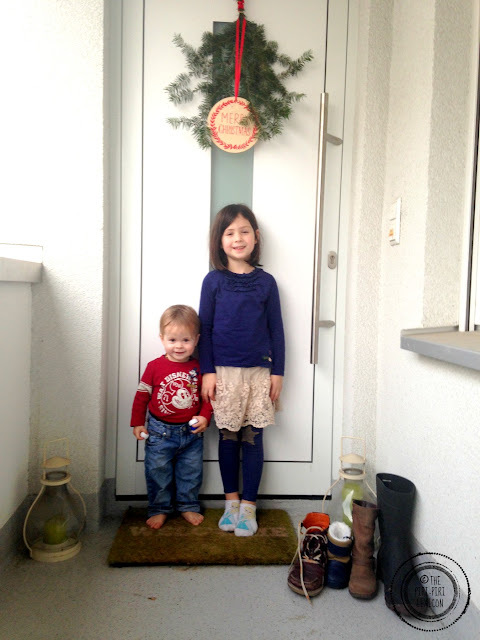 On the Eve of the 6th of December, children clean their boots and leave them by the front door. They often also leave a little snack (carrot, biscuit) for Saint Nicholas and his donkey/horse. Saint Nicholas will then leave a little gift, chocolates for the children during the night. One of the odd thing for me about this holiday, in all other aspects similar to Christmas, is that it is not a holiday. I mean that people go to work, school, etc. So, that on the morning of the 6th, kids open their gifts and then make their way to school. 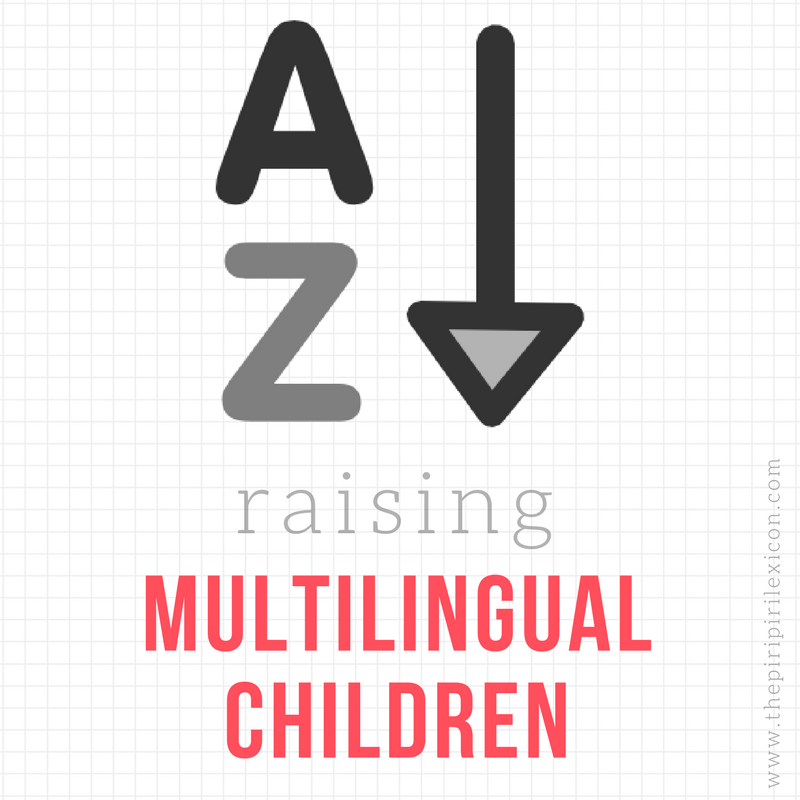 There is no long family meal, playing with new toys while staying in pyjamas, etc. Some families will meet up (with grandparents for example) but for a lot of them, it is just not possible. We now celebrate Saint Nicholas at home and at school/kindergarten as the children. 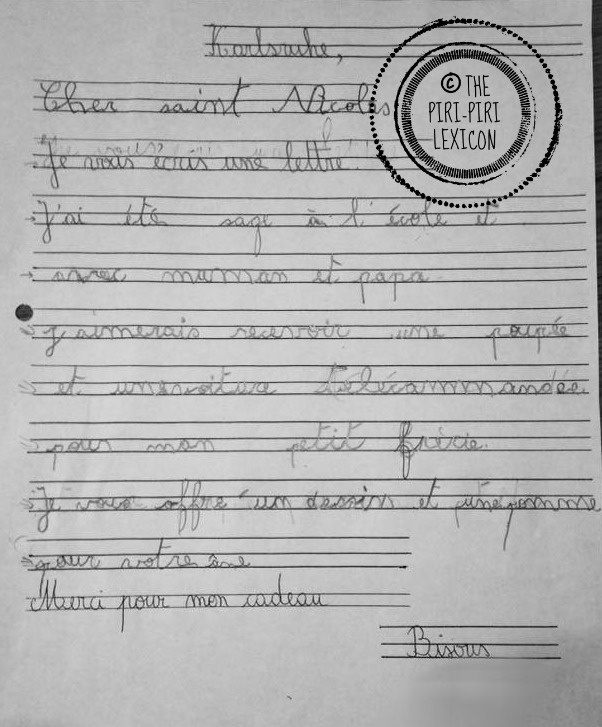 Our 6-year-old even wrote him a letter (at school) with her gift wish. 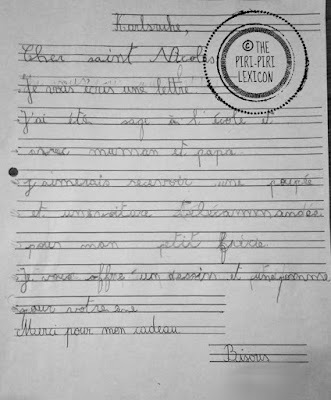 But her real list is still for the Père Noël! Blending traditions (almost) seamlessly. Growing up in the East of France, Saint Nicholas has always been part of our traditions, with the shoe and milk in front of the door, and we bought or baked Jean Bonheur, or Mannele or Mannala (petite brioche en forme de bonhomme), we always got Saint Nicholas in chocolate :-) My mum told me that growing up in Lothringen, kids got presents for Saint Nicholas but not for Christmas, it gradually changed over the years. I knew it was celebrated in the East of France but never knew that kids still got gifts quite recently. I think in this part of Germany (at least) it is gradually moving towards smaller and smaller gifts as Christmas takes over. Ahah! My husband's family does that for New Year.